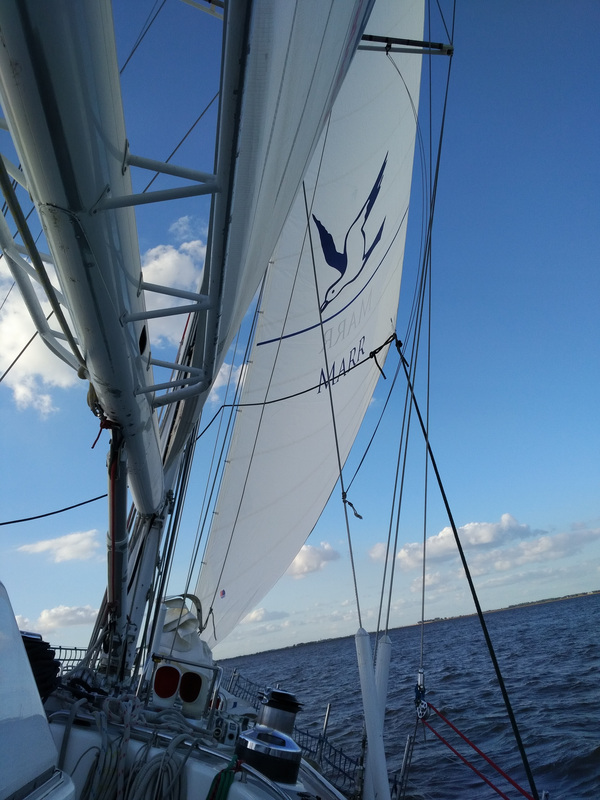 Colleagues from J.Marr (Seafoods) Limited were invited to take part in one of three team building sailing days in September to crew the 72ft CatZero yacht on the Humber. CatZero is a local charity currently supported by the Marr group helping marginalised young people get into training and employment and use sailing as part of their programmes to develop team building skills. The teams met up on the yacht at Hull Marina for an early start to catch the high tide and were welcomed onboard the yacht by the CatZero staff with bacon and sausage sandwiches and cups of tea and coffee before introductions were made. Danny the director of sailing gave everyone an overview of the charity and the use of sailing as a means to build teamwork skills. Then everyone was kitted out in warm clothing and given a safety briefing on board before guiding the yacht through the loch gates and out onto the Humber. The morning was spent learning various aspects of sailing, raising the sails (including the new sail featuring the Marr group logo), steering and lots of winching! We learnt how to tack and jibe and one volunteer from each team was lowered over the side to perform a man overboard rescue manoeuvre. After a hearty lunch cooked in the yacht’s galley we were briefed on the two hour sailing challenge we had to complete as a team. Two members from each team were nominated to act as navigators and two to take the role as team leaders on deck. The navigators were required to give instructions and direct the rest of the team. Using maps and information on the wind speed and tide flow the navigators had to decide how best to try and navigate the course by passing buoys which were worth different numbers of points. Then by using the onboard computer navigation system they had to direct the rest of the team how to sail towards each buoy. All the teams had very different experiences due to the variances in wind speed and tides on the day and for one team the total lack of wind meant they were going backwards at one point! A challenging two hours later after crossing the finishing line we motored back to the marina in the sunset, tired and happy. Everyone who took part thoroughly enjoyed the experience and the office was full of competitive chat in the days after. A big thank you goes out to all the CatZero sailing crew for looking after us so well and giving everyone a truly memorable day out of the office. Please click on the photos below..